A few amusing signs for your delectation. Someone told me that this one was funny, but I don't know why. I'm very innocent you see. Just in case you can't read this, it's an ad for Lisa Facial Hair Salon. 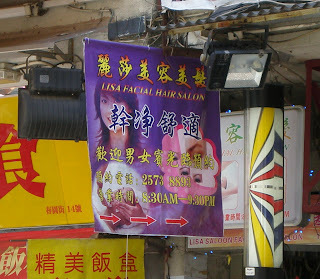 I suspect that rather than whipping your 'tache up into a beautiful little quiff, Lisa offers both facials AND hair services.